The Express release date was Friday, October 10, 2008. True story of football great Ernie Davis, the man who broke college football records and racial barriers in the early 1960s, becoming the first black player to win the Heisman Trophy. The running back was drafted into the NFL, but his career was cut short when he was diagnosed with leukemia. 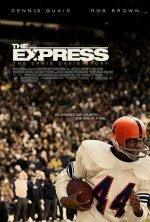 Based on Robert Gallagher's book, "Ernie Davis: The Elmira Express."